Collabor88 has been open for a while now, and has many amazing releases. Like theese Aimee heels from CandyDoll. They are so ute and a lot of parts are color changeable like always. Love it. The Joelee Lashes are from Michan and come with both 5 lower and 5 upper lash options. Thye are all very cute. CandyDoll and le fil casse has decided that now and then they will release a collaborative clothing. Like this. The Yuki top is from CandyDoll and the Yuna skirt is from le fil casse . And they look amazing together. The top and skirt come with nice color huds for many parts of it. The cute shoes are from Candy Kitten and as usual they come with a big CK color hud for laces, diamonds and sneakers. Applique has opened its dorrs again. A lot of good stuff there as always. For example there are these Glitter [Dreamy] nail appliers from Cazimi, The cute Crisp eyeshadow in many different shades from ARTERY and the Jenn Allen lipstick from P O E M A. The Chisato lashes are from MICHAN, and can be found at Sanarae. They come with upper and lower options. Candy Kitten released another cute bikini for this summer. This time with patterns. It also comes with a cute short crop top in single colors that you can wear over the bikini. As always it comes with a big color hud. The Lashes are from MICHAN and come in a few different options for both upper and lower lashes. The cute little bunny necklace is also from MICHAN and comes in 4 colors. The Dya platform shoes are a pretty Group Gift for CandyDoll vip group members. So cute and come as a fatpack with lots of options. Love them. Belyjewels: Bitsy Belly Jewels – SIlver String – Sweet Thing. For this summer, I have the prfect bikini for you. Sunny days bikini set is from Candy Kitten, and as usual it comes with her fantasic big color hud. The cute shoes that fit for example a stroll on the beach, are the Yuki heels from CandyDoll. They come with a big color hud with many changeable parts. MICHAN released this cute 2 piece necklace for Whimsical that just opened. Comes in more colors then silver and can be worn seperatly. Also the chisato lashes are from MICHAN, nd are avaliable at Sanarae. They come in many options. Applique offers a lot of stuff. For example the Zhoe tattto from Juna and the dont let me down lipstick set from *Navzar*. CandyDoll released 2 new things for C88. One of them is cute Selina jumper with has many different jeans textures and some color textures too. You can choose To have it with or without the flower print. The Selina Heels have the usual CandyDoll color HUD with many different parts to changes color on. Amias released the Helle necklace for Cosmopolitan. It comes in gold and silver, and can be worn seperatly. The Destiny glossy lipstick is a new release from LeLuck at Applique that will be opening on the 15th. It comes with a HUD with 10 different color options. 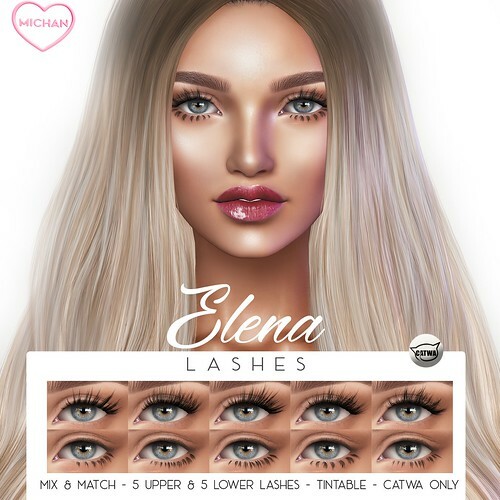 The Shontelle Lashes from MICHAN come in 5 upper and 5 lower lashes options.